Free Carrie and Lynn from the dark spell! Find morphing objects and other collectibles. Extras include music, art, wallpaper, and screensavers. Collect puzzle pieces to unlock more stories! Help Edward and Lynn keep Morgana’s creatures out of the human world, and purify the Well of Truth. Witches' Legacy: The Dark Throne Collector's Edition is rated 4.3 out of 5 by 45. Rated 5 out of 5 by Yurnmesis from Exceptional graphics and excellent, entertaining storyline. Overall: At the start a book explains the previous storyline so you understand the backstory. Looked forward to where the tasks took me and how the storyline moved forward smoothly. Well- developed graphics with a variety of interesting scenes. One of the most enjoyable games played in a while with a mix of anticipation and curiosity where the journey would take me. Graphics: Excellent, great color. Very well developed game. Sound Music: Appropriate for task and scene and often pleasant. Hint: Excellent took you where you needed to go. Sometime a real challenge guessing the why of some inventory items collected, but the hint took care of any confusion. 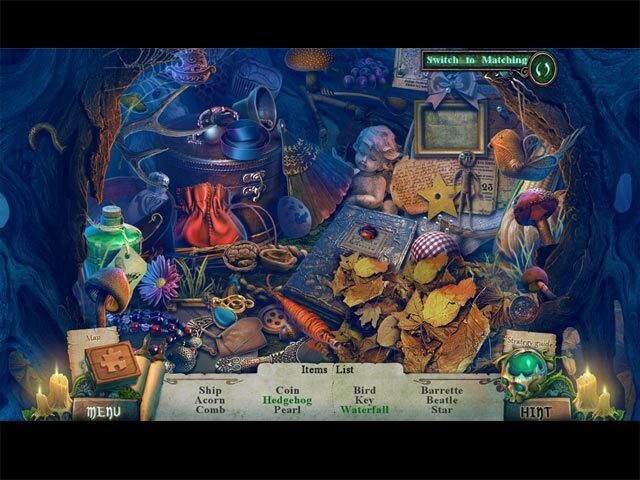 Hidden Object Games: Good variety, quick hint return, beautifully crafted scenes and objects Objects easy to see and some force you think how to complete them. Mini Games: Nicely done. Most are logical and fun. A few more difficult and will be enjoyed by mini game fans. Morph and puzzle pieces: Collect for achievements. Map: Map was excellent and a good resource. Strategy Book: Was there if you needed it. Rated 5 out of 5 by tutortime from Excellent Game ! Very enjoyable game. The storyline, graphics are good and the game is very long. The CC edition is worth the money as its also very long for a bonus chapter and has many new scenes to interact in. Rated 5 out of 5 by hermitcave from Witch Hunter saves Witch, Thwarts Otherworld Takeover - News at Eleven Several months have passed since Lynn destroyed Morgana [is she really gone this time?] in Slumbering Darkness and she is trying to settle down to a normal life with her husband, Edward, Witch Hunter, but no such luck. Lynn and Edward have established the Tom Charles Museum of Magic to honor her brother. At the opening, Lynn notices a stained glass window that has an affect on her and she is drawn into it. Carrie, her adopted mother, is thrown into a locked room and a skeletal creature emerges and captures the Imp. As Edward, you have to free the Imp and Carrie and find out what happened to Lynn. Carrie has been incapacitated by a sleep spell so is of no help but you find a tool called the Glass of Truth that will show the true nature of what is displayed in it. Discovering that the stained glass window is actually a portal to the Otherworld, you and the Imp must enter the portal and find Lynn. As you explore the Otherworld, you soon discover that when Lynn destroyed Morgana, Ruler of the Otherworld, it left the Otherworld in chaos and seeking a new ruler. You also discover that the sorcerer, Mathais, has resurfaced and is helping Lynn, who is under a spell, to become the new Dark Queen and ruler of the Otherworld and does not want to be rescued. Mathais, of course, has a hidden agenda of his own where he plans to kill Lynn at the moment she is crowned and absorb all of her magic into himself making him extremely powerful. You have your work cut out for you. Being the sixth in the series, don't expect much change from previous episodes except a new story and more troubles for Edward and Lynn. You are provided with the background story in a book "Witches Legacy Book" located at the beginning where the "Play" button is located so even if you have not played any of the previous episodes, you will have a basic understanding of what went before now. 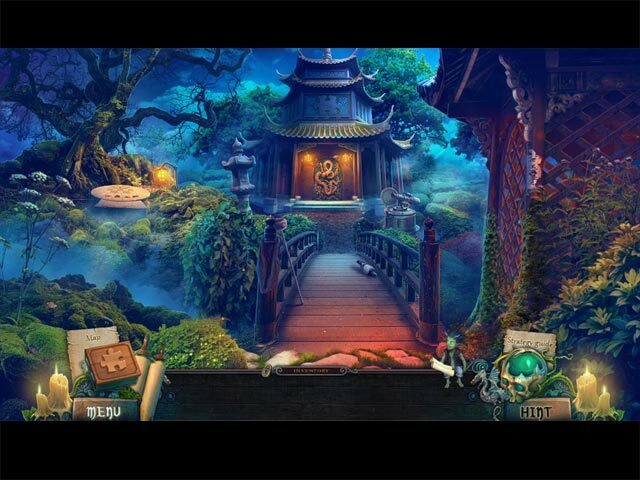 The expected excellent graphics, animations, music and voice overs are there as well as the hidden object scenes and puzzles. The Imp helper is there with his usual need of help from some device to accomplish his tasks. He has to be getting old to require so much help. There are a lot of objects in the game that you can interact with that have nothing to do with accomplishing your goal and apparently are there as 'bling.' It does give you something else to do in the game if you like that sort of thing. There are 35 morphing objects, 36 puzzle pieces and 14 Imp helping items that can be found. I must admit that they have made the morphing objects a little easier to find without having to sit and wait for it to morph as in other games. 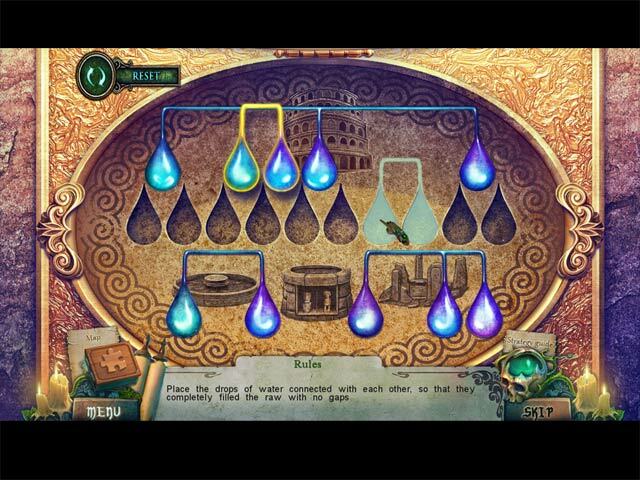 The puzzle pieces are used to construct 4 puzzles at the end of the game in "Extras" that, when completed, give some background about the subject in the puzzle. There is an excellent jump map provided also. Hidden object scenes are some of the most interactive I have played in a while and provides some nice variations that make doing them more fun and interesting. I especially liked the where everything is up-side down on what appears to be an island. It added that additional challenge that made it more fun. There is the choice to play a match game instead. BONUS CHAPTER: In saving Lynn, you were required to cleanse the crown of the Dark Queen in the water of the Well of Truth but, by doing so, you unknowingly tainted the water with that evil and now it is causing the creatures in the Otherworld to turn evil and now they are trying to break into our world. Now you have to go back to the Otherworld and cleanse the well with waters from the other three magic wells. A nicely done extra for the Collector's Edition. Rated 5 out of 5 by TubularGames from Excellent Quality Hidden Object Game This game includes everything a casual BF gamer could want. From a great story line - that can be followed even with breaks in game play - to fantastic interactive graphics. The Imp is fun to watch but best off all are the HO scenes, which are challenging but engaging and take a number of different forms.I have spent hours relaxing playing this game and listening to the accompanying music. Overall great value for money. Rated 5 out of 5 by kisifer99 from Another Good one in this series! I went back and got two of this series I had missed before completing this one, and had a lot of fun with all of them. The Imp is my fave of the "helper" characters (with Elf the dog close behind). He is entertaining and works well, though sometimes they do strange things to fit him in! I look forward to more of these, perhaps into the third generation of characters. Rated 5 out of 5 by Italia47 from Terrific game! The lil' imp is too cute for words, too! While the thoughts are still fresh in my mind, I have to tell you that this game rocks! At least it did for me! I'm almost at the end of the Bonus Game. You get a lot of bang for the buck in this game. There's a wide variety of tasks to complete and it's so much fun. The HOPS are varied and unusual. You'll learn about the characters as you piece the puzzles back in place; morphing objects to locate and when you have a game such as this one that is intriguing, one can get engrossed on the tasks and forget about the morphing objects, so I'm getting better at that. Your well's been sealed with dark magic and you've got to remove it by finding the healing mushrooms to dispel it, just one of the fun things to complete. The storyline is great but it's the same genre--witches, ghosts, demons, whatever! One of these days, I'm hoping these developers can create a game about a jewel heist with the most beautiful scenery our eyes ever feasted upon! A change of pace/scenery would be good; nonetheless, this game does have stunning scenes. Your helper, the lil' imp, is so cute and if you click on him, he'll perform different functions--for instance, he'll get out his guitar and play a real quick tune; spin the top; at one point he took out a pendant on a chain and almost hypnotized himself; and other cute and fun things that I got a big charge out of! The only thing I would change on the imp's appearance is I'd get rid of the horns and give him brown or blue eyes! Still, he's too cute for words, and truly a great assistant. The developers really put in a lot of thought and work into this game. Bravo to all! The artwork is stunning; the music/special effects are terrific; the text didn't always jive with the voiceovers, but that's a minor thing. The actors were very good, too. Oh, you also had the option of playing the matching game instead of the HOPS, and just for the fun of it, I would from time to time. Everything flows so well in this game. I'm giving it a 5-star rating and highly recommend it as it is compelling and fun game to play. Rated 5 out of 5 by Twrexx from Most Excellent Challenge! I don't write reviews for every game, but this one warrants it. This was a fun story with very clever HOPs. I like how the developers mixed them up a bit. It gets tiring when they are all the same, but this one kept it interesting. Also, the mini-games are challenging enough to be fun but not so difficult as to be frustrating. The scenes are beautifully rendered, and that Imp is quite a character. He's fun to have along (click on him when he's sitting still for some additional cleverness). All in all, you can't go wrong with this one. Very enjoyable! Rated 5 out of 5 by babs0258 from Fun and interesting!! Loved this game! Challenging, fun, interesting story line. Twists and turns. Rated 5 out of 5 by timothya from Give This One A Chance I just about gave up on this one way too soon. It turned out to be a great game, fully worth the effort and the bonuses made it worthy of being a CE. I'd give it four stars but the bonus game kicked it back to five. Pros: Great graphics, lovely colors, and LOTS OF PLAY! The latter is all too rare these days, but it went on and on and got better and better. Plot decent and coherent. Puzzles just about right level of difficulty, HO's of several different styles. Cons: Too many cut scenes, especially in the beginning. Completely took the rhythm of the game off the rails. Assistant is less annoying than most but didn't seem all that necessary. In the first "alternate world" the direction was occasionally not very logical, you often didn't really know what to do next. Overall, though, stick with this one. Full value for length, full value for bonus game. Rated 5 out of 5 by ares2 from exellent! I always buy the games of this serie but this is finally the best: graphic, storyline, music and puzzles.Moreover 8 long chapters and 1 bonus chapter just like another game! The witches' dark legacy continues as Lynn becomes possessed!